This is an evil wizard’s tower. The first level only has a permanent levitation circle that can be activated or deactivated by the wizard. It’s his first line of defense since there are no stairs to access the higher levels of the tower. The second level has accommodations and quarters for visitors. There is also a torture room and a cell. They are used constantly by the wizard to keep lab specimens. You can find the wizard’s own quarters in the third level. There is also a den and living room with book cases. The wizard spends his time here, studying and researching magic. The fourth level contains the arcane laboratory. It has everything an evil wizard or necromancer needs to research and try new magic. 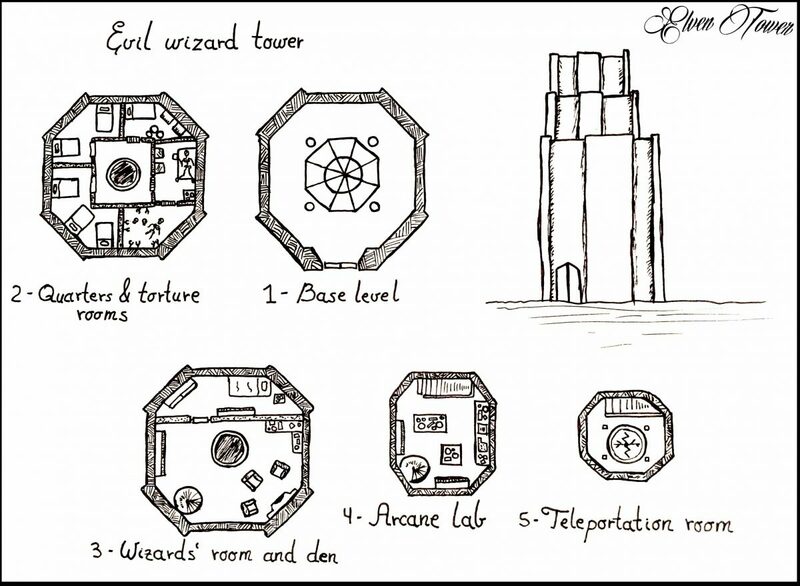 The last level has a permanent circle of teleportation whose sigil is known only to the wizard.